Eureka Springs, Arkansas is not a large town but it is a colorful community with a colorful past – and there’s no better place to discover that than at the Eureka Springs Historical Museum. Eureka Springs “sprang” into existence from the discovery of a spring of “healing waters” by one Dr. Alvah Jackson in the early 1850’s. His subsequent marketing of the water’s curative powers and the native American legends surrounding it brought a lot of attention and health seekers. In 1879, when a friend of Jackson’s, Judge J.B. Saunders, claimed that his crippling disease had been cured by these spring waters, it was as if a dam burst. In one year, Eureka Springs grew from an impromptu spa community into a bustling boomtown. Come 1880, Eureka Springs was incorporated as a city – the fourth largest in Arkansas until the turn of the century. 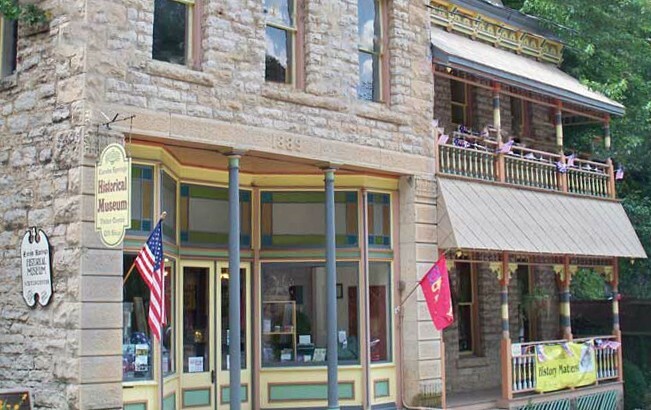 The Eureka Springs Historical Museum’s mission is to preserve and protect this continuing history and, in a bustling town that continues to attract countless visitors every year, that’s no small matter. Visit the Eureka Springs Historical Museum and see the colorful past of this unique town. An ever-growing collection of photographs, mementos, and artifacts are on display in a variety of permanent and rotating exhibits on the main floor. The second floor of the museum holds more exhibits, as well as an Art Gallery featuring work by some of the local artists that helped usher in Eureka Springs’ art boom. The 1930’s in Eureka Springs saw a renaissance of arts in the community and, because of this enduring shift, the area has been and continues to be home to literally hundreds of artists. The Eureka Springs Historical Museum has worked to amass a large and growing collection of their collective art over the years, including paintings, photographs, prints, ceramics, jewelry, and sculpture. More than 200 artists continue to live in and enliven the Eureka Springs area. So come, take a walk through Eureka Springs colorful history of native legend, tent city, healing spring waters, art renaissance, and more at the Eureka Springs Historical Museum in downtown Eureka Springs, AR.